The last official operating system update for Amiga computers with Motorola 68000 CPU architecture was AmigaOS 3.9 BoingBag 2. The infamous BoingBags were – of course – the „Service Pack“ equivalent in the Amiga universe. Since then (March 20th, 2002) only some components were updated by the original authors and contributors i.e. ram-handler, OpenURL and some more. 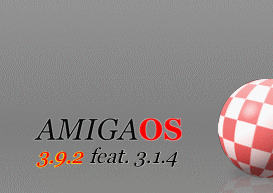 For myself I decided to call this slightly updated OS version AmigaOS 3.9 BoingBag2+. During the years two inofficial BoingBags (3 and 4) were published, but due to their inofficial character, sometimes unclear license conditions and their (in my opinion) partly „hacky“ ingridients I never installed them. In conclusion the described OS setup works here since more than 16 years – and is still a important part of my digital life. Last year someone mentioned that there’s an new AmigaOS Release 3 version for 68k based Amigas in the works. Shortly after the first bug fixes and new features were „leaked“ it was clear that this updated and refreshed release will not be an update to AmigaOS 3.9 but to the older Commodore release 3.1. For those like me who operate heavily expanded AmigaOS-3.9-RTG-Amigas this message was of course somewhat puzzling: That would be a downgrade, wouldn’t it? This new AmigaOS version for 68k Amigas – named AmigaOS 3.1.4 – was released September, 30th 2018; more or less 16.5 years after last one (the above mentionend 3.9.2). It was published as a digital download version (read: no new physical Kickstart ROM). In the meantime someone can buy physical copies of the OS – like in the ol‘ days with software floppy disks and a fresh replacement Kickstart ROM. Due to license, copyright and other issues this OS update could only be done by starting (more or less) from scratch – read: the AmigaOS 3.1 sources from Commodore. The „more or less“ means that nevertheless some code and stuff from the 3.9 release could be used for this update as well. For a lot of Amiga users this is not a problem, because todays user base of the original Amiga 68k systems is of the same heterogenity than in the old days. So a lot of people still use their Amigas for playing games, watching demos and the like – and a big bunch of them still operate their systems with the original Commodore AmigaOS 3.1! Gladly I’m not the only one who would like to use their „fine tuned“ high end Amiga system with the latest possible OS update without loosing to much of the graphical and technical convinience that came with the 3.9.2 release. 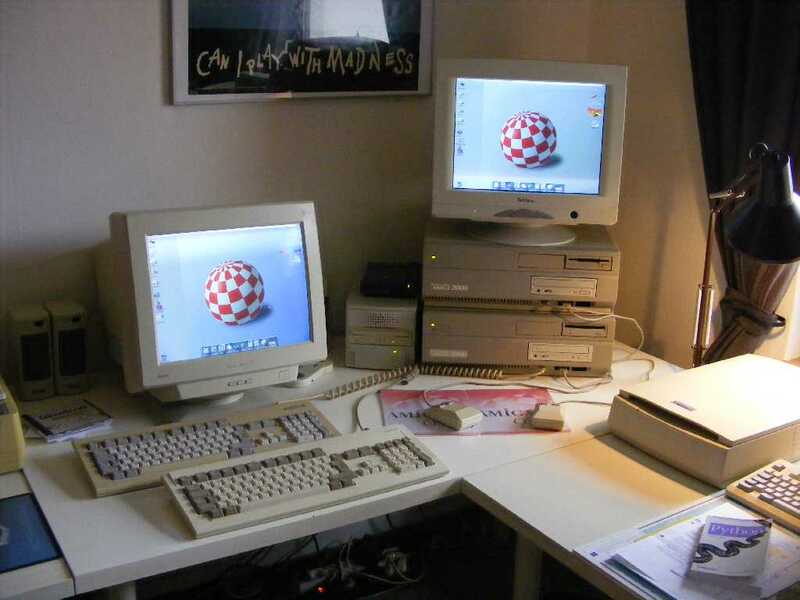 One of the AmigaOS 3.1.4 beta testers, Ignacio „Gulliver“ Gully, created an update script that merges an existing 3.9 setup with the latest 3.1.4 components – composing a hybrid OS that (hopefully) shows the best possible compromise of both releases. Of course I did not just ran that script, but opened it with Multiview and stepped through every line – gladly Ignacio commented every step. Using my Amiga 2000/060 as the script reading machine I did all steps from the script manually on my Amiga 2000/040. After copying and tweaking everything manually at my running 040-system I eventually reached the point of the first cold (!) reboot. I should mention that I have a disk based „soft ROM“ setup where the first cold boot reads all necessary Kickstart modules and then does a second boot to initialise and utilize the new disk read modules as the Kickstart to be in charge. This is something I’m used to, because the former AmigaOS 3.9.2 ROM update worked in the same way – doing a double boot from cold start. Lucky me my Amiga just booted fine into Workbench without any error messages or hangs. After this I brought back stuff I de-activated during the update process; i.e. the user-startup script and every tool and commodity (one after another) inside the WBStartup drawer. Now that my A2000/040 was in a decent shape I did the same procedure with my Amiga 2000/060 – which just did a fine cold reboot afterwards. The software setup of my two Amiga 2000 is more or less identical (despite CPU and other hardware specific differences) – with one exception: while my 040-system uses Picasso96 as the RTG subsystem my 060-Amiga has CyberGraphX v4 installed and running. Due to the fact that the new AmigaOS 3.1.4 intution.library does not play fine with a CyberGraphX setup I could not activate it on this system. Further I did not replace the AmigaOS 3.9 IconEdit with the „old“, non-Glowicon aware 3.1.4 version and I still have RAWBInfo in my WBStartup – up to now there’s absolutly no replacement in functionality and convinience in regards of Workbench icon handling. Further I liked to use the heavily optimised icon.library from Peter Keunecke instead of the 3.1.4 variant. Be aware of the fact that for a disk based system (like mine) you have to set the PURE protection bit for Peters library – if you don’t do that your system will not boot! After some testing I found a bug in the new ilbm.datatype – so I did a rollback to Stephan Rupprechts v44 ilbm.datatype. The 3.1.4 release shows huge amounts of work that went into fixing (long standing) bugs – be it in the Kickstart kernel modules or disk based components like CLI commands and the like. So it is a highly welcomed update and bug fix release that all 68k OS releases since the initial Commodore AmigaOS 3.1 should benefit from. I am of course aware of the fact that Hyperion and the involved developers of AmigaOS 3.1.4 do not support officially any self-cooked merge of any OS release newer than 3.1. Nevertheless – up to now – I did not have any negative effects from that hybrid I’m using now on my Amiga 2000 computers. This entry was posted in Resistance & Liberation and tagged Amiga, AmigaOS, Retro by cha05e90. Bookmark the permalink.